Kick off your visit on the 17th (Fri): learn about wildlife with up-close encounters at Melbourne Zoo, take in the local highlights with Royal Botanic Gardens, and then admire the natural beauty at Fitzroy Gardens. On the 18th (Sat), you'll have a packed day of sightseeing: admire the masterpieces at National Gallery of Victoria, enjoy breathtaking views from Eureka Skydeck 88, then see the interesting displays at Melbourne Museum, and finally make a trip to Flinders Street Station. To find other places to visit, ratings, and more tourist information, read Melbourne travel route planning site . New Delhi, India to Melbourne is an approximately 16-hour flight. You can also do a combination of train and flight. The time zone difference when traveling from New Delhi to Melbourne is 4 hours. Traveling from New Delhi in May, things will get colder in Melbourne: highs are around 20°C and lows about 9°C. Cap off your sightseeing on the 18th (Sat) early enough to travel to Sydney. 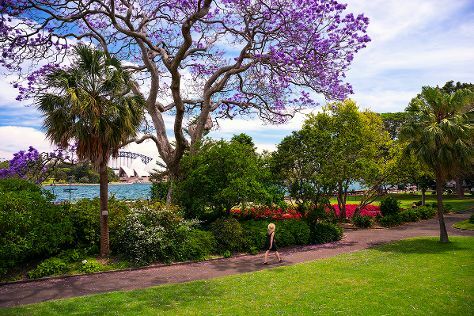 Kick off your visit on the 19th (Sun): wander the streets of The Rocks, then make a trip to Sydney Harbour Bridge, then see a show at Sydney Opera House, and finally admire the natural beauty at Royal Botanic Garden Sydney. Get ready for a full day of sightseeing on the 20th (Mon): stop by Sydney Fish Market, observe the fascinating underwater world at Sea Life Sydney Aquarium, and then wander the streets of Darling Harbour. For ratings, reviews, where to stay, and more tourist information, read our Sydney trip planner . You can fly from Melbourne to Sydney in 3.5 hours. Alternatively, you can do a combination of shuttle and flight; or drive. Traveling from Melbourne in May, expect Sydney to be a bit warmer, temps between 24°C and 14°C. Wrap up your sightseeing by early afternoon on the 21st (Tue) to allow enough time to travel back home.